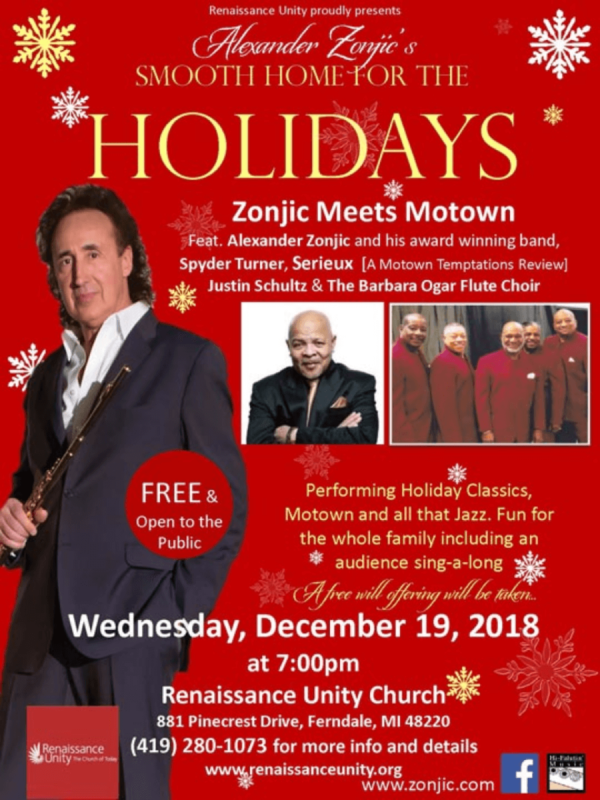 Alexander Zonjic's Smooth Home For The Holidays featuring Alexander Zonjic and his award winning band. Spyder Turner, Serieux (A Motown Temptations Review), Justin Schultz and The Barbara Ogar Flute Choir. Performing Holiday Classics, Motown and all that Jazz. Fun for the whole family including an audience sing-a-long. A free will offering will be taken. No tickets are needed. Doors will open at 6:30 PM. Alexander Zonjic's Smooth Home For The Holidays featuring Alexander Zonjic and his award winning band. Spyder Turner, Serieux (A Motown Temptations Review), Justin Schultz and The Barbara Ogar Flute Choir. Performing Holiday Classics, Motown and all that Jazz. Fun for the whole family including an audience sing-a-long. A free will offering will be taken. No tickets are needed. Doors will open at 6:30 PM.